6 months in the making: a whirlwind 36 hours of fun, friends, and fabulous food with a generous sprinkling of coding, learning, designing and making, topped off with a selection of amazing prizes. Oh, and Mr Blobby. 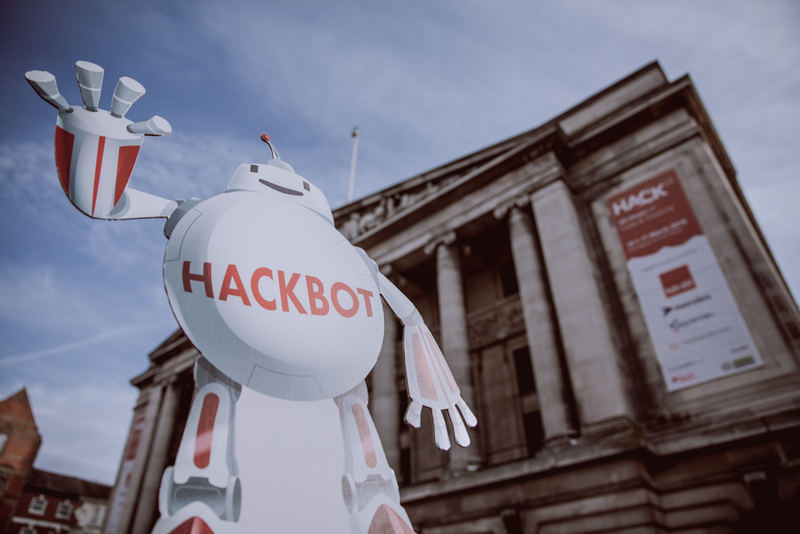 For the third year running more than 150 hackers took over the entire Nottingham Council House, the stunning building that epitomises Nottingham and looks out over the market square. Emblazoned with seven-metre-high Hack24 banners, it’s the perfect building for Hack24, steeped in history and provides a great juxtaposition between the old and the new. We had more sponsors than ever this year, ranging from local companies to international names; some putting forward challenges, some running workshops, and all providing a hefty amount of swag for our intrepid hackers. 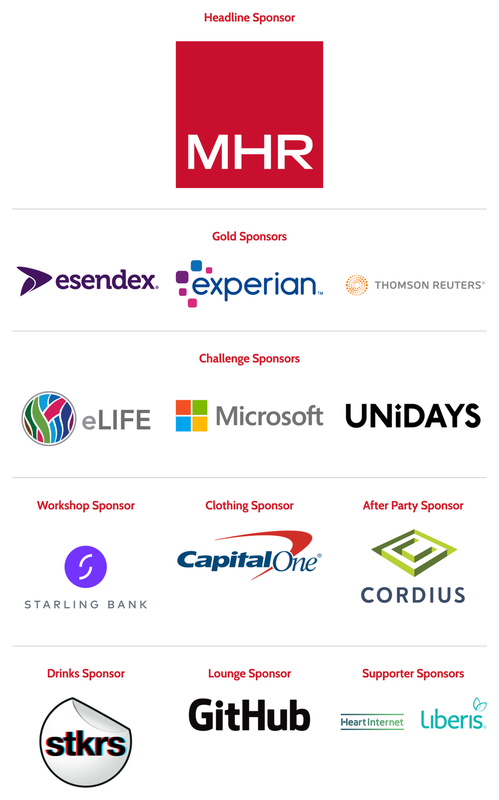 Challenges were put forward by MHR, Esendex, Experian, Thomson Reuters, Microsoft and UNiDAYS, with a best video prize put forward by Tech Nottingham. There was a definite theme to challenges this year, with three sponsors asking hackers to design something for social good. New for 2018, we had a couple of workshops on Saturday afternoon, provided by Microsoft and Starling Bank. Both were extremely well attended and received and this is something that we'll be sure to look at again for next year! A highlight for many this year, Rick Jesse and the team at STKRS created custom team stickers for those teams that had pre-registered their hack teams with Hackbot. We were absolutely blown away with Rick's creativity and the speed with which he designed and created around 40 custom stickers! Hack24 simply couldn't happen without its 20 strong team of red hooded heroes! Each and every volunteer started and ended the weekend with a smile; no problem was too big for them to solve. Lots of first time volunteers too this year, with some travelling quite a hefty distance to be there. Special mentions go to Jonathan and Shaun who were both on their FOURTH year volunteering at Hack24! 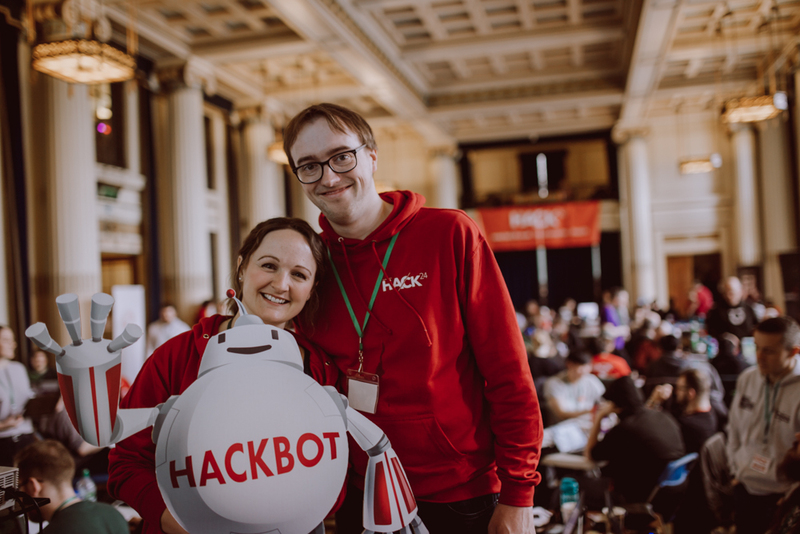 Oh Hackbot - it just wouldn't be Hack24 without you! 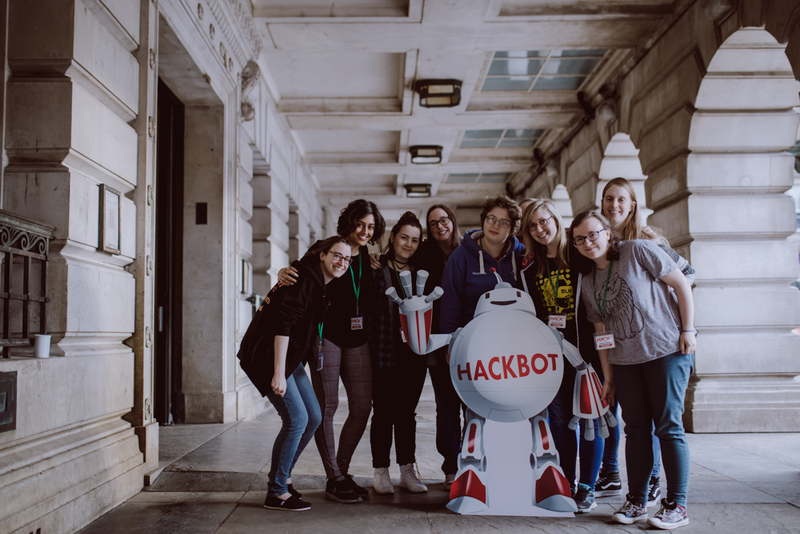 Hackbot was brought to life by the very talented Mair Perkins and took centre stage in many a photo! Faye Vincent and her team at Truffle Catering once again provided an astonishing array of delicious food, including an epic Sunday lunch on (ahem) Sunday. Their hot chocolate has now become a Hack24 cult classic. As is now tradition, Saturday evening saw the Hack24 team put on a gameshow for hackers, to give them a much needed break away from their screens. Andrew Seward was Noel Edmunds and Ed Manley was the banker as hackers played for literally tens of pounds in Deal or No Deal. 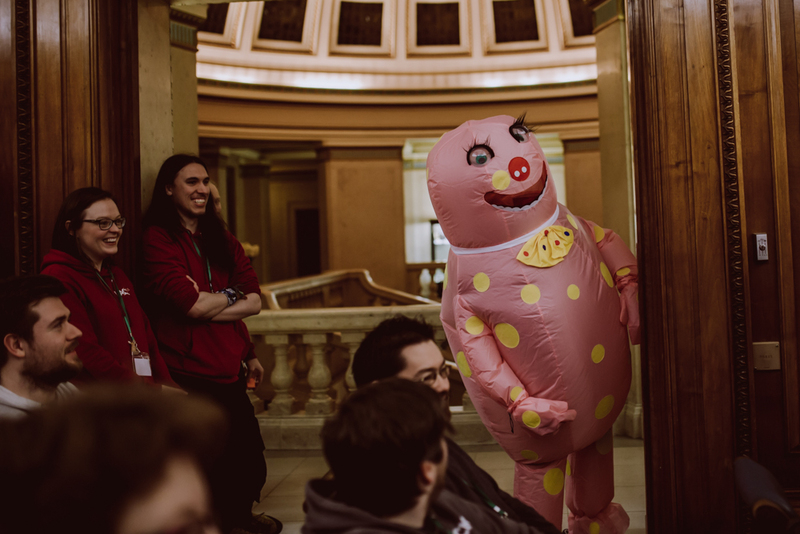 Oh and Mr Blobby gatecrashed and much hilarity ensued. The Hack24 hackers are not just awesome coders and designers but film directors too, as the fantastic hack videos showed. It gets harder and harder each year to choose our favourites - here's a small selection. We had more hacks to judge this year than ever before and a record number of entries (49 teams with 56 separate hacks entered) made our judges'... uh... judging very difficult! Big congratulations to our winners, and a huge well done to everyone that entered - it is simply amazing to see the projects created in such a short amount of time - you should all be very proud of yourselves! Sponsored by the lovely folk at Cordius, many hackers, volunteers and sponsors headed over to Belgo for a few hours of drinks, rest and relaxation with their friends and reminisced on what had been a very successful weekend. Huge thanks to all involved: hackers, volunteers and sponsors. We couldn’t have done it without you! With this blog post, we wanted to shine a light on some of Hack24's unsung heroes: the caterers! They work tirelessly all weekend to provide food for over 150 people, and delicious food it is too. We chatted to Faye and her team about food and Hack24.